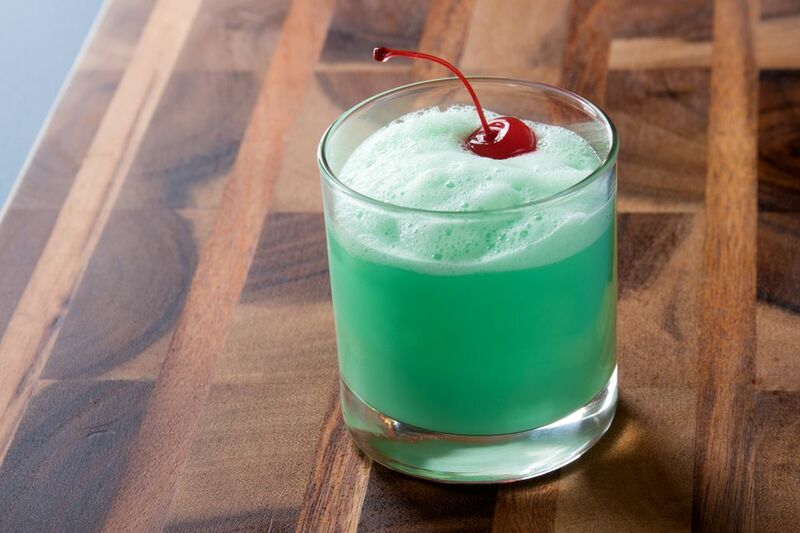 For anyone who's a fan of creamy, minty drinks, the Irish eyes cocktail is a great choice. This recipe creates one of the most delicious whiskey cocktails you will find and it's incredibly easy to mix up. All you need to make the Irish eyes is Irish whiskey, green crème de menthe, and cream. The result is a fun, flavorful green cocktail that you'll definitely want to share. So next St. Patrick's Day you can give your sweetheart an Irish Eyes cocktail, look into her eyes and say "Tá tú go h-álainn" (meaning "You're beautiful"; pronounced taw two guh haul-inn). Bottoms up! Strain into an old-fashioned glass over fresh ice. Garnish with a maraschino cherry. Crème de menthe comes in two colors, green and white (clear). If you want to retain the green color, be sure to pour the green version of the liqueur. The drink will taste the same with white crème de menthe, so if that's all you have, go ahead and use it. For the Irish whiskey, there's really no need to pour from your best bottle. A mixed drink like this is the perfect excuse to save a little money with a good budget-friendly mixer like Tullamore Dew or Jameson. Choose your cream according to your taste. Regular cream will produce a perfectly rich drink while milk is a good option if you want something a little lighter. A good middle ground between the two is half and half, which is often preferred for drinks like this. Whichever you choose, make sure the cream has not expired! Nothing ruins a cocktail faster than an outdated dairy product, so check your expiration date and give it a sniff test before pouring and you'll avoid wasting your booze. Rather than cream, turn to a cream liqueur as a substitute. Both RumChata and Irish cream are excellent choices for this drink. There's also less opportunity for the liqueurs to go bad as both have a shelf-life of at least six months after opening (no refrigeration required). Rim the glass with a little cocoa powder for a fun touch. With each sip, you'll get a delightful hint of chocolate, which is always a pleasant pairing for mint. If you're looking for an edible stir stick, pop a peppermint candy stick into the drink. How Strong Is an Irish Eyes Cocktail? The actual alcohol content of the Irish eyes drink will depend on which spirits you choose to pour. On average, with an 80-proof whiskey and 50-proof crème de menthe, it shakes up to a mild 12 percent ABV (24 proof). That's equivalent to the average wine, so this cocktail is as pleasantly mild as it is delicious.